When light is emitted from a particle that contains a few hundred atoms, the wavelength of the light is affected by the size of the region – this is a very interesting quantum effect that provides a way of tuning wavelengths of Light Emitting Diodes (LED) independent of the band-gap of the material. In particular, there is a possibility of creating a white LED or a green LED with improved efficiency. A team from McGill University have grown InGaN/GaN nanowires 50 nm in diameter, with quantum wells a few nanometer thick. These nanowires showed modified wavelength emission, increased internal quantum efficiency of 57% and elimination of reduced emission at high current (current droop). These combined advantages suggest a significant new opportunity. The McGill team reported their results at the fall 2011 IEEE Photonics Conference. The pictures below, from the McGill paper, show the device architecture and an image of the forest of wires on the silicon surface. 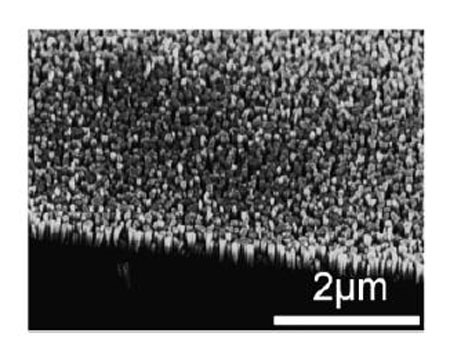 Schematic of device structure on top, SEM picture of the “forest” of nanowires on bottom. Published in Abstracts of the Fall 2011 IEEE Photonics Conference. To me, the interesting question is how they make these quantum structures. Their approach starts with a 111 orientation silicon wafer in a Molecular Beam Epitaxy system with a radiofrequency plasma. 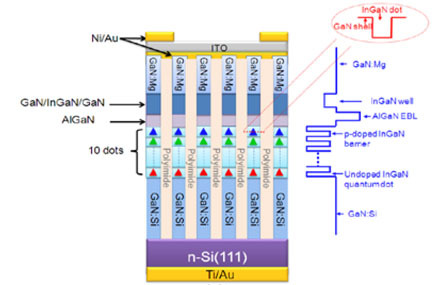 “Something” about the diffusion processes leads to the formation of discrete GaN nanowires normal to the surface. The gaps between the wires are filled with insulator, the surface is etched back to expose the tops of the wires, and electrical contact is made to the tops of the wires. The result is a self aligned nanostructure that is part of an electrical circuit, as shown in the drawing above. A secondary advantage of these LED is that they are being created on a silicon wafer that opens up all sorts of manufacturing advantages. The principle concern is the use of MBE which is an inherently slow process.